With flowers hanging from doorways, streaming from trains and adorning the trunks of elephants, the state of Kerala in south India bursts with colour during its Onam festival in September. This harvest festival commemorates the Hindu god Vishnu and the mythical king Mahabali. 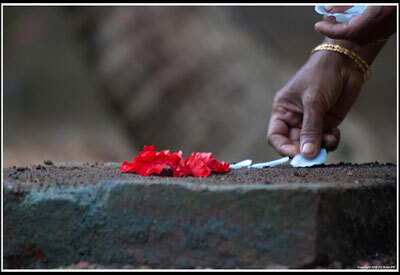 The event falls in the month of chingam in the Malayalee calendar (August – September). A number of cultural pastimes are employed during the festival, but one in particular stands out. 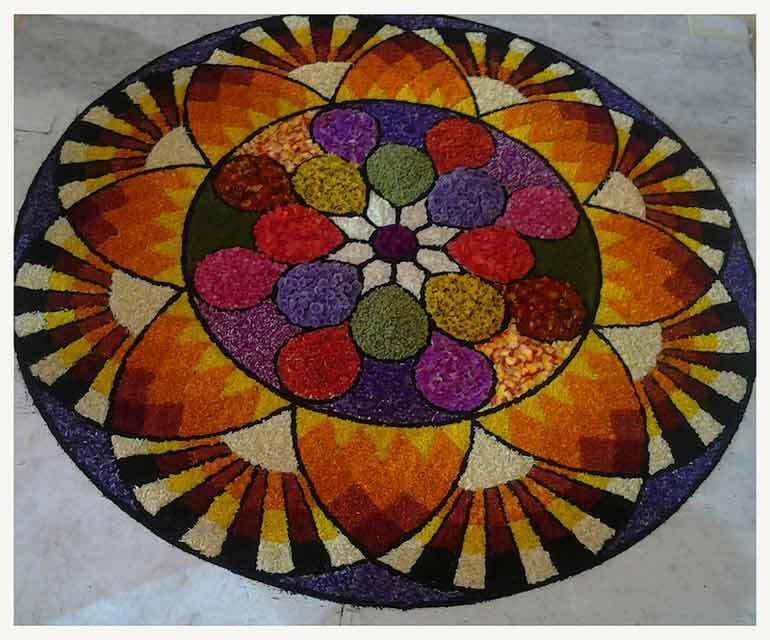 Considered the hallmark of Onam, pookkalam is a type of floral design in which intricate arrangements are created over a ten-day period, growing each day to four or five metres in diameter. A new design is thought of daily, representing the expanding circle of life. It’s believed that to create something from nature is auspicious so they make designs called aththa-poo. Dozens of varieties of hibiscus, Arabian jasmine, Spanish jasmine, marigold and oleander come together to form multi-tiered designs with idols of Mahabati and Vishnu placed in the centre. During the festival, four tonnes of flowers are imported from neighbouring states, Tamil Nadu and Karnataka, a day, which is in addition to the flowers used regularly for puja ceremonies and for women to put in their hair. 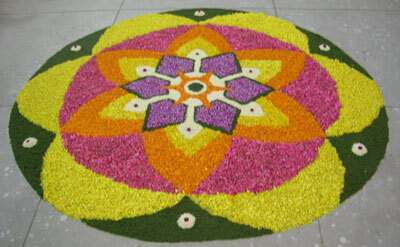 Flowers play a big role in south India both in festivals and in daily life. Floral design is a common sight during various festivals as well as in the aforementioned pujas that happen on a daily basis and for wearing. The tradition has changed quite a bit over the years. Purists are upset that it has commercialized. Where in the past children would get up early with their pooka (basket) to gather flowers, now the trend is to buy flowers from the market. Large decoration competitions are held with statewide public participation and big prizes awarded. And now with the prevalence of technology, people are preparing designs on their computer rather than by hand. The meaning of Onam is to connect to nature so the purists could be right in saying that by taking out the flower gathering and purchasing the onasdya (feast) rather than cooking it the meaning is being lost. One thing that doesn’t seem to be getting lost is the skill with which these designs are made. With a tradition this old, being passed down from generation to generation, the local population make it seem effortless to create these intricate aththa-poo. Aside from being a colourful treat for the senses, it’s a wonder to watch the local women at work, making it a fine stop on any India trip, particularly for flower lovers.